The Gibson BRITE WIRE SET 10-46 Electric Guitar Strings Set, gauges .010 - .046. 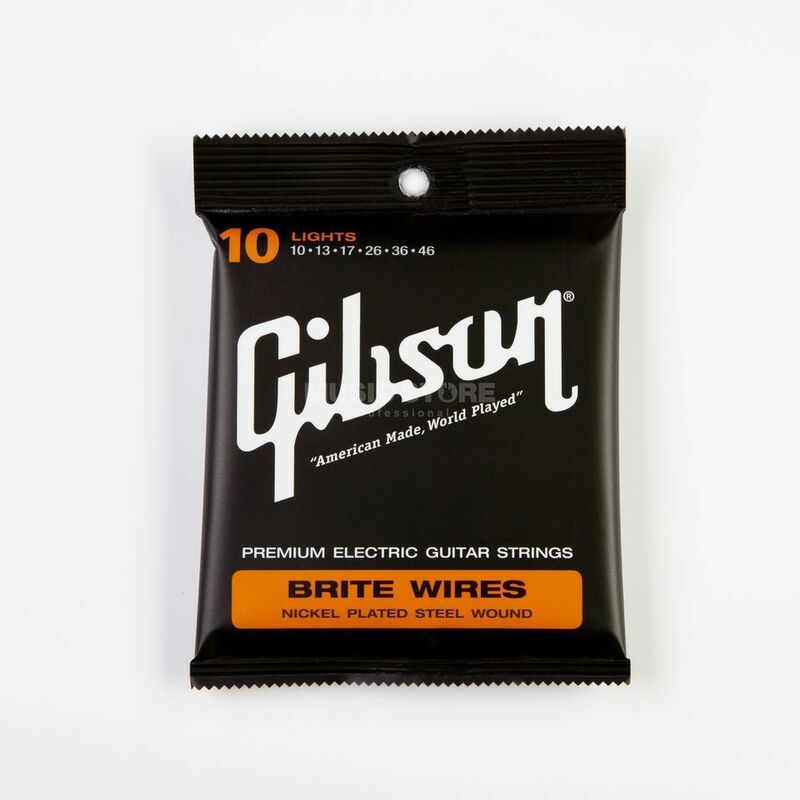 The Gibson BRITE WIRE SET 10-46 Nickel Plated Steel Wound light strings. Brite Wires are specially formulated to give your guitar a crisp attack, with the nickel plating adding warmth to the overall tone. These strings feature our Swedish steel "hex" core for added tuning stability. Brite Wires tune up fast, and hold their tone longer. No matter what style of music you play, you'll hear why Brite Wires are the choice of professionals world-wide! Says Motorhead guitarist Phil Campbell, "I love my Brite Wires. They don't break. They don't rust. They never get out of tune. They have the perfect tone. Why change it if it's working? I trust 'em that much...."
Perfectly fit my Epi Les Paul Ultra, sound nice, are a bit hard, good for rythm playing, soloes are a bit hard on them, Keeps very very good in tune. For people who want to buy new Epiphone guitar this is a great choice. Hi there, hope you use the Gibson Britewire strings for electric guitar. If not, please start to use them. The sound of your guitar will change as it was for my old seventies SG. The brightness and sensitivity of these strings are incredible. I bought these for my Gibson Les Paul Studio. Sounds awesome as I have come to expect of all Gibson products! Highly Recommended! Product of elevated technical quality. Easiness in the purchase and great speed of delivery. Fabulous prices and marks. Great team of professionals. The best shop of musical instruments of the world. Even living to 6. 000 kms on distance Music Store it is the best shop of musical instruments.